So, last month, we went over earthquake preparedness. A major part of that is your Emergency Supply Kit. I keep an Emergency Kit in my car for multiple trips a month to RP. However, when I went to pull mine out to write this article, I found that I had pilfered the whole kit down to nothing, so basically, I was carting an empty backpack down and back. So, thankfully, due to this research, my kit is back to fully stocked. It’s advised to be able to make it on your own for at least three days. Put together two kits. In one, put everything needed to stay where you are. The other should be portable so you can take it with you if you have to get away. Keep at least a three-day supply of water per person; estimate a gallon per person each day. Children, nursing mothers, and sick people may need more water. If you live in a warm weather climate, more water may be necessary – YES RP this means you! Store water tightly in clean plastic containers such as soft drink bottles. We always bring a case of bottled water every trip down. Store at least a three-day supply of non-perishable food. Select foods that require no refrigeration, minimal preparation and little or no water. Sounds like a good plan on a regular day! In an emergency, someone may be cut, burned or suffer other injuries. If you have basic supplies you are better prepared to help someone when they’re hurt. Many injuries aren’t life threatening and don’t require immediate medical attention. Knowing how to treat minor injuries can make a difference. Consider taking a first aid class, but simply having the following things can help you stop bleeding, prevent infection and assist in decontamination. 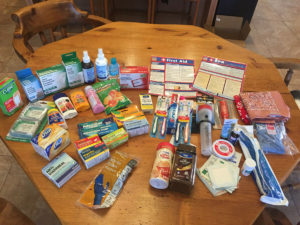 You can purchase a pre-made first aid kit online, but I was able to restock my kit at the dollar store, with more and larger quantity supplies for about the same cost. I added things to assist if you happen to be hung-over (it’s a realistic possibility in RP!) I also added instant coffee and creamer because seriously, cannot function without caffeine. Keep canned food in a cool, dry place. (Word to the wise…I kept my food in my backpack in AZ during the HOT summer, the food, was basically useless). Now I keep my kit in my laundry room unless I’m traveling. Change stored food and water supplies every six months. Write dates you store it on all containers. Re-evaluate your needs yearly and update your kit as your family’s needs change. Keep your supplies kit in one or two easy-to-carry containers, such as a camping backpack or duffel bag. Information adapted from several sources: Ready America, Ready.gov, Fema.gov.